An ingrown toenail is a common condition in which the corner or side of one's toenail grows into the soft flesh of that toe. People who have curved or thick nails are most susceptible, although anyone can suffer from ingrown nails as a result of poorly fitting shoes, injury or improper grooming of the feet. Diabetics and those with vascular problems or numbness in the toes need to be more cautious in treating and preventing ingrown toenails because they can lead to serious complications, including the risk of losing a limb. • Soak your feet for about 15-20 minutes two to three times a day in warm water. This reduces swelling and relieves tenderness. • Choose sensible footwear such as wearing open-toe shoes or sandals until your toe feels better. • Place a small piece of cotton or dental floss under the nail and wet the cotton with water or antiseptic. Change the cotton or floss daily until the pain or redness subsides. • If you have diabetes, check your feet daily for signs of ingrown toenails or other foot problems. 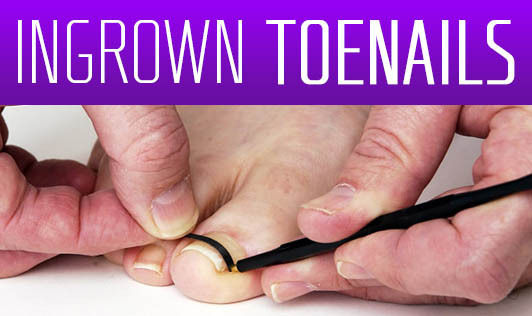 • Trim your toenails straight across and don't curve your toenails to match the shape of the front of your toe. • If you have diabetes or peripheral vascular disease, see a podiatrist regularly to have your nails trimmed professionally if you're unable to trim them yourself. • Keep your toenails at a moderate length. If you trim your toenails too short, the pressure from your shoes on your toe tissue may direct your nails to grow into the tissue. • Take care to buy and wear properly fitted shoes. • Experience relentless discomfort in your toe and notice pus or redness that seems to be spreading. • Have diabetes or circulation impairment to your lower extremities and experience foot soreness or infection.